If the original INSIDIOUS managed to astrally project itself into your heart with tales of soul-napping and supernatural search-and-rescue missions, today is looking pretty good for you. 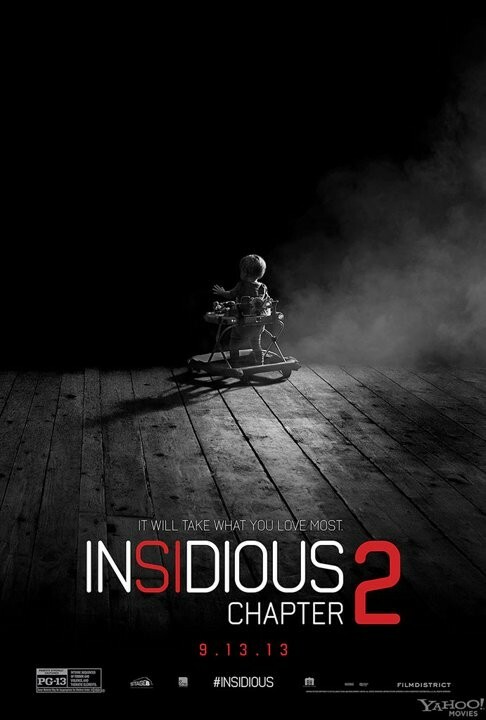 See, director James Wan’s (THE CONJURING) INSIDIOUS: CHAPTER 2 is here. CHAPTER 2 picks up from the silliest part of the original – the end – and rides its dopey momentum through a second funhouse of grabby ghosts, psychic shenanigans and hijinks on the astral plane. Also jump scares. So. Many. Jump scares. When last we left the family Lambert, husband Josh (Partick Wilson) had just returned from a trip to the netherworld (AKA The Further) only to find that a spirit from his past had returned, killing medium Elise Ranier (Lin Shaye) in the process. As CHAPTER 2 picks up, Josh is starting to look sorta Jack Torrance-y and his wife (Rose Byrne) and kids are getting all haunted up again, so Josh’s mother Lorraine (Barbara Hershey) teams up with Elise’s bumbling assistants Spec (screenwriter Leigh Wannell) and Tucker (Angus Sampson) to uncover the truth behind Josh’s childhood experiences and the mean ol’ ghost lady. INSIDIOUS began with the promise of a fair-to-middlin’ modern haunted house spooker and then plummeted into a cheesy, nonsensical fantasy. CHAPTER 2 starts at the cheese and only gets goofier. Lorraine and her Venkman-wannabe investigators embark on a paranormal scavenger hunt through horror movie clichés, including kid ghosts, an abandoned hospital and a castrated bit of PYSCHO redux. Along the way, Specs and Tucker pile on some predictable homophobic yuks and Elise’s old medium buddy Carl (Steve Coulter) joins the motley crew. Of course, there are plenty more trips into The Further, a limbo dimension that still resembles an infinite fog machine screen test broken up by the occasional decaying mcmansion a la every late-period A NIGHTMARE ON ELM STREET sequel you hated. But this time, they go farther into The Further, traveling not just through realms, but also somehow through memories and time (and an earlier INSIDIOUS movie *wink*) as well. Meanwhile, back at the Lambert house, Josh goes full on THE SHINING (the crazed homicidal nutball part… not the actual shining part). These scenes more than any other exemplify a feeling that dogged me throughout the film: it’s hard to tell whether the dialogue is just so bad that it sabotages actor performances or whether the actors’ performances are so over-the-top as to emphasize passably idiotic dialogue... or whether some of this stuff really is meant to feel halfway tongue-in-cheek. Just as a basic rule, when a horror movie's scares are consistently getting bigger laughs than the supposed comic relief, there's something amiss. The whole of CHAPTER 2 is a ludicrous tonal clusterhump that’s matched in speed and volume by a prodigious, confounding mythology that unspools in concert with the necessities of the plot. 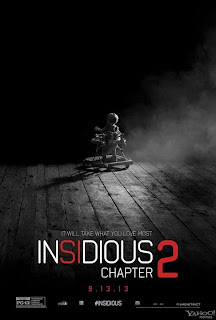 If James Wan’s recent ouvre is a thanksgiving dinner (stay with me… I bet you a dollar this one works) INSIDIOUS: CHAPTER 2 is like the plate banging, potato-hucking kids table to THE CONJURING’s staid and overly prim grown-up table. Where the former is content to revel in noisy mess, the other tries overly hard to maintain a semi-serious countenance and convey a concerted sense of maturity. Here’s hoping he finds an in between. Like an eleven-year-old who walks over to the grown up table to get another roll and they let her taste some wine or something. I owe you a dollar.